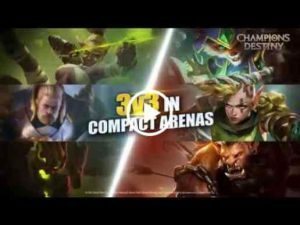 Champions Destiny : Marvel at the unique twist on Multiplayer Online Battle Arena (MOBA) tailored for a legendary mobile experience. PvP clashes are played on a compact battlefield and reduced to five minutes to fit around your schedule. Join our robust community with frequent collaboration: There will be regular updates from the team and a space for your voice to be heard. The game can’t reach its full potential without help from the players! Climb up the leagues to try out 7 different arenas! Play 5-minute PvP games against real opponents in real time. Join players in the arena to fight in teams of 3! Discover 6 classes and 4 rarities of champions. Fight using special abilities to crush opponents. Make your way through the arena by destroying towers. Use brush to get a jump on your enemies. Be a hero and dive to get a kill. Grow your skills to become a legend. Collect champions of four rarities: Common, Rare, Epic, and Legendary. Unlock champions of higher rarities and evolve skills as you go up the leagues. Join an alliance and cooperate with others in 3v3 battles. Participate in weekly tournaments to get the best rewards. Chat and discuss the best strategy to defeat others in the arena. I really like this game. It’s great and funny. loved it, cant wait to see more updates in the future!